If you missed out on the Anastasia Beverly Hills (ABH) Nicole Guerriero Glow Kit, which retailed for $43, I definitely have the juice. As you know Nicole's Glow kit was limited edition and is no longer available at Sephora stores. You could cop it from a third party sites like "letsbehappy.com", or hope to score an authentic palette on eBay, BUT first check out this $10 dupe which will leave you pleasantly surprised and save your coins. Anastasia Beverly Hills Nicole Guerriero Glow Kit (to the left). Bad Habit Beauty Rosé palette to the right. This gorgeous palette you see is the Rosé Palette by Bad Habit beauty (BHB). I will be sharing swatches, similarities, differences, and my overall opinion on this $10 dupe available at Shop Hush. To be clear, a dupe is not a replica or "fake" as it in no way attempts to pass as another brand. It is simply another product that, in comparison, will achieve similar results to the original product. Is this dupe worth it or nah? Let's see. ABH "Kitty Kat" Versus Bad Habit Beauty "#ALLDAY"
First, let's compare the swatches. #ALLDAY is a dupe for Kitty Kat. #ALLDAY is slightly pinker in color than Kitty Kat. Both colors contain silver in them, but Kitty Kat is slightly more golden in reflection than All Day. ABH "Forever Young" vs BHB "Cheers"
Cheers is a Dupe for Forever Young. Cheers is spot on. When applied to the skin as a highlight both colors look so similar its challenging to find any differences. ABH "Daydream" vs BHB "Pinkies Up"
Pinkies Up is a Dupe for DayDream. Pinkies up is slightly lighter in color. Daydream has more of a peach tone whereas pinkies up appears slightly pinker. Both have silver glitter specs, but Daydream has a little more of a golden undertone and whereas Pinkies up lets off slightly more silver. When applied with a brush, Daydream is more pigmented but Pinkies Up can be built up to achieve the same vibrance. Is it THAT noticeable of a difference? Nah, but definitely worth noting. ABH "Forever Lit" vs BHB "Shine"
Shine is a dupe for Forever Lit. These colors are pretty identical in coor. Both have a blueish appearance. Forever Lit is more pigmented and creamier in formula. However, Shine can be built up and does achieve the same vibrance as Forever Lit. ABH "Glow Getter" vs BHB "Champagne"
Champagne is a dupe for Glo Getter. These two colors are identical and apply very similarly. I didn't notice any significant difference in these two colors. ABH "143" vs BHB "Bubbly"
Bubbly is a dupe for 143. When swatched, 143 appeared deeper in color (more bronze), but when applied to the cheekbones Bubbly is spot on. Both colors are so very similar when applied to the face. However, Bubbly is slightly lighter in color. Swatches of the Anastasia Beverly Hills Nicole Guerriero Glow kit (on the left) and Bad Habit Beauty Rose Palette (on the right). Okay sis! So is it Worth it? I'd say yes! Glow Getter (duped as Champagne in the Rosé Palette) and 143 (duped as Bubbly in the Rosé Palette) look very good on brown skin-tones, and you would be surprised what you could do with the peachy tones. I love mixing Daydream (duped as Pinkies up in the Rosé Palette) with Kitty Kat (duped as #ALLDAY in the Rosé Palette). 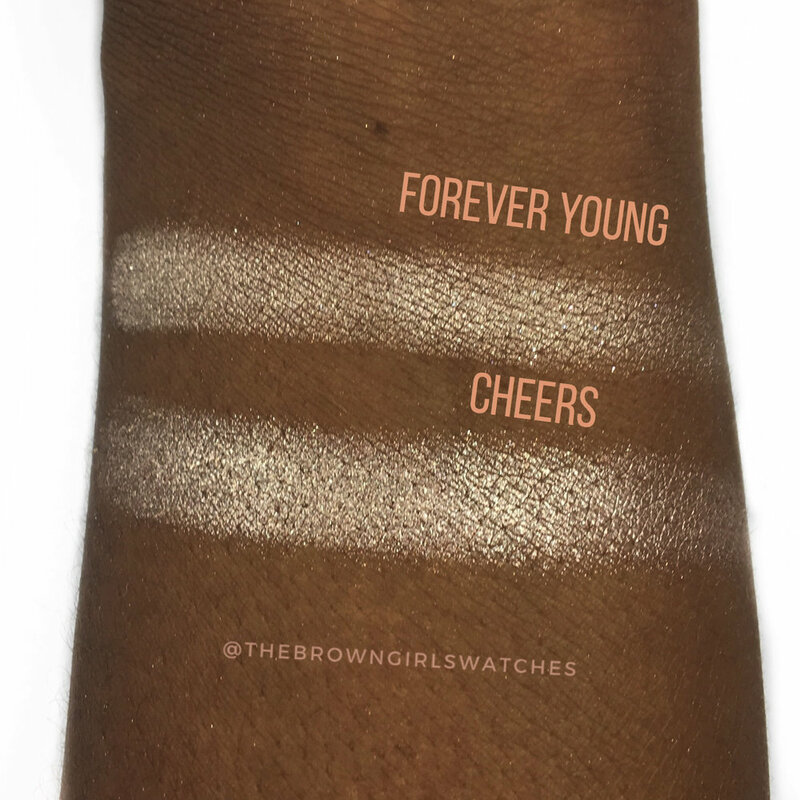 Forever Lit and Forever Young can be pulled off as a nose highlight if your going for a @Ronkeraji type glow. Just apply lightly. Overall, when it comes to formula, The Nicole Guerriero Glow Kit seems more creamy and more pigmented. The Rose palette is slightly more on the powdery side, but the rose palette applies to the skin nicely. It is not a significant difference ESPECIALLY for the price point. Plus you get a bomb mirror with the Rose Palette! This palette is availible at Shophush.com and on the Shop Hush app. So let me know! Will you be adding the Rose Palette to your collection? Let me know down below.